We've rolled out a hotfix for the game that contains the new DLC pack: Treasures of Turan, as well as a UI fix when using controllers. Please remember that updates can mess with your installed mods. We suggest taking a backup of your current database before updating to any new patch if you have mods installed. The riches of the eastern kingdom of Turan await you, exiles! Our latest cosmetic DLC, the Treasures of Turan Pack, brings the opulent gilded palaces of Turanian culture right to your fingertips. 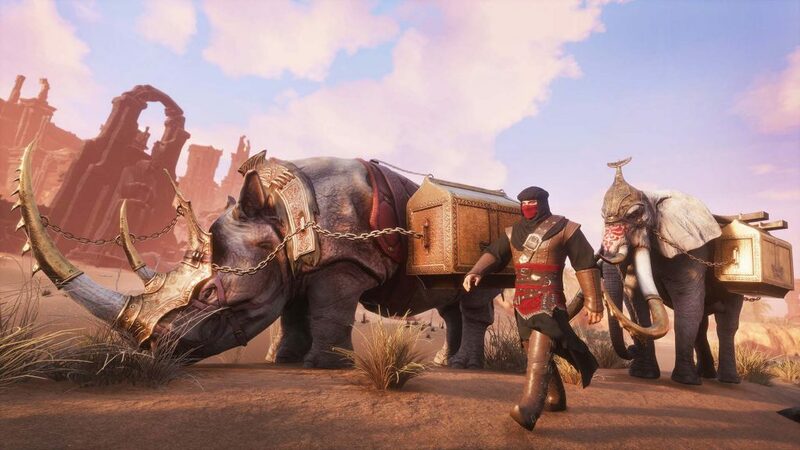 With the Treasures of Turan Pack you can build palaces adorned with glittering statues, tame rhinos and elephants as pack animals, and dress in the finest Turanian silks and Phalanx armor. You can read the full announcement here. Treasures of Turan DLC is now available for purchase. Fixed an issue that would prevent the Disable Thrall Decay server setting not being selectable when using a controller. We have a public bug tracking board here[trello.com]! You can check this to track the issues that get brought up by the community the most. In the "For prioritization" column you can vote for the issues you would like us to prioritize and we will make sure it gets moved into development asap. You can read the full details on how it works on the forum post here[forums.funcom.com]. We heard your input regarding the inconvenience with having to switch back and forth between the main game and our TestLive servers. To make it easier for you and because we really value your testing and feedback, we added a separate product for the TestLive server on Steam. If you own Conan Exiles on Steam, you should now see a separate Product called "Conan Exiles - Testlive Client" in your library which gives you the option to install an additional instance of the game specifically for the TestLive servers. Please be aware that this will prompt you for a full additional installation. We are aware that not everyone wants install or has space for two full installations. For those of you who don't want to play through the additional TestLive Client, you can still access the TestLive servers through our old method[forums.funcom.com]. I love the slower regen, but still waiting on optimization passes and then sorcery. Why oh, why do you guys keep putting out DLC when there are so many existing things in the game that need work? For the love of Howard, what's the issue here? @happy hippo lmao, weird no one complain of been disconnected everyday at raid time. So when’s actual content coming? Or are you guys just strictly out for money now? Would like to see rafts be a thing, more polish on the game, but nah more paid DLC sounds right.. Thanks for the updates! Though excited for a sorcery update. the boat of the entrance of the new city is defective, in case it enters and click to return, goes to an area outside the game.